I've been looking at upgrading to 30" tires and doing research on different options. 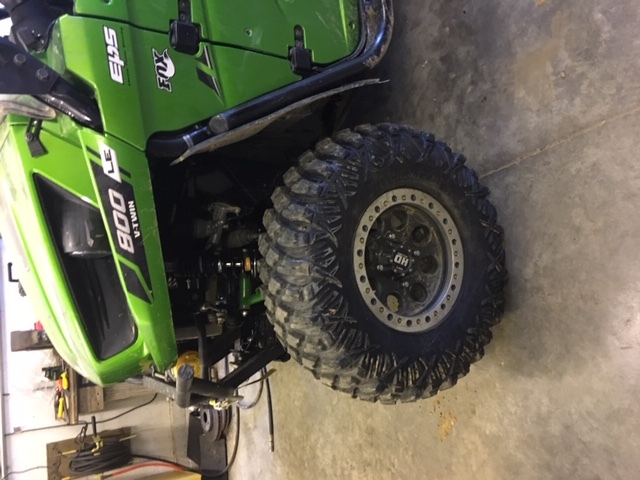 Currently running 28x10-14 SuperATV Intimidators which have been a decent tire, but wanted something a little taller, a little lighter, and worked better on hard pack and rocks. After a lot of thought and research the Maxxis Carnivores were at the top of my list but these like-new 30" Crawler XG's popped up for sale an hour away for a great price. Three riding buddies have them with nothing but positive reviews. I do the East Coast/Midwest riding with big trips to Windrock and Brimstone, and plan on some trips to WV. Don't do mud-bogging but several trails we ride have different level of mud and slick trail you just can't avoid. The Intimidators worked great in mud....as long as it was at least a couple inches deep. However if you are on a hardpack dirt trail and get a burst of rain where there is just a thin layer of slop they slide all over the place, and same thing with rocks. I've been on rides with other machines with Carnivores, Blackwaters, and Bighorns and they all worked a lot better in those conditions. Maxxis Carnivores were at the top of my list because of the weight of 34 lbs. for a 30" tire, squared off tread profile, and a decently aggressive tread. For comparison of weight the 28" Intimidators are really heavy at 45 lbs. Weight wise the Crawlers are right in the middle at 39 lbs., so hoping the reduced rotating mass will offset the larger diameter. Also had Blackwaters, Roctane XD, and Roctane X2's on the list. I have heard that Blackwaters were not that good on hardpack but slick trails and they run small. A guy I ride with all the time bought a set for his RZR and sold them after 2 rides and replaced them with Crawlers. Really like the look of the Roctanes but they are heavy. Crawlers were low on the list mainly because of the price, but finding a good deal on a set of used ones moved them up. Last edited by 6.2Blazer; 04-15-2019 at 10:16 AM. I ran 28 inch crawlers on my Teryx for almost 1200 miles but they were the XR version. They performed great in everything except for deep mud. They had roughly half tread when I sold them and some of those miles were a lot of asphalt driving. XR version has less tread than the XG when they are both new. Never had a puncture or anything on the trail. They did run on the short side. Measured 27 on a 14x8 wheel. I’m sure you would gain some with a 7 inch wide wheel. 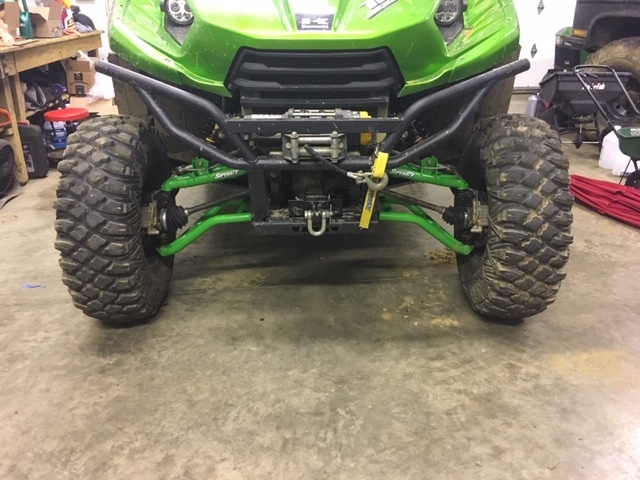 I measured some mounted 30 inch XG crawlers on a RZR at the dealership and they only measured 29 inches just to let you know. Couple RZRs I ride with have them as well and they’ve had great luck with them too. If you get these tires let us know how they fit with your new shocks. I would love to run 30s and have my stock arms too. Do you have the floor board recall up front? I did buy the tires.....I'm always looking for a deal so couldn't pass these up. The XG's seem to wear faster than some others because they have a softer tread compound, but they work great in rocks and hard pack because of that. Just debating on when I should swap tires. With the new shocks it would be nice to get a little seat time in with the Intimidators so I can get a better before and after feel with the shocks. But it's also a little like Christmas and hard not to play with the new toys. I'll be interested on the fitment also. Currently have the Intimidators pumped up to 15 psi which makes them noticably taller than the typical 10 psi I run. Rolling an unmounted Crawler up to them, the Crawler is a little taller and should be even taller when mounted and with air in them. The Intimidators would rub on the passenger side wheelwell when cranked full right and flexed out a little, but it is also the huge blocky lugs on the edge of the tread that was doing that. No floorboard recall on mine. Got two of the tires swapped out last night (takes awhile with beadlocks!). 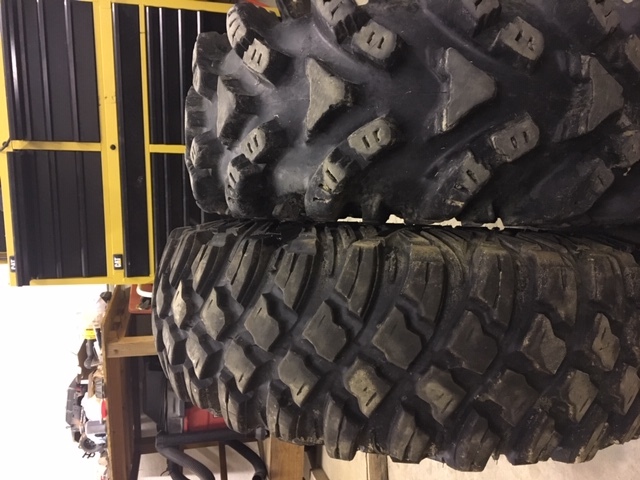 Below is a picture of 28x10-14 SuperATV Intimidators with 75% tread compared to 90% tread 30x10-14 Crawler XG's. Both are mounted on rims with 15 psi. The Crawlers measure 2 1/4" taller. I need to do work on the front suspension for clearance until I can get some offset a-arms (they were already in the plans, just need to sell the Intimidators first). With Highlifter lift brackets and less preload on the stock shocks then factory (reduced lift) the Intimidators would slightly rub the passenger side plastic wheelwell at full lock and flex out. I just recently installed Bandit 2.0 shocks that are longer and allowed me to remove the lift brackets and still maintain lift.....to be honest really don't have the new preload dialed in yet but couldn't wait any longer to install the tires.....but the 30" Crawlers rub hard on both sides just turning lock to lock sitting in the shop. Was planning on adding a little more preload on the front and dropping the tire pressure down to around 10 psi should also help. Hoping some of the power loss from going to the taller tire will be offset from the Crawler's being lighter. The 30" Crawlers are listed as being 6 lbs per tire lighter than the 28" Intimidators....may not sound like much but when it's rotating mass is should make a decent amount of difference. Last edited by 6.2Blazer; 04-15-2019 at 10:17 AM. Got them all mounted up last week. I just installed Bandit shocks also so dialing in the preload at the same time....should have waited to install the tires until the suspension was more dialed in but just couldn't hold off. I did have to add preload to the shocks for tire clearance as originally the fronts would rub at full lock just sitting in the garage and the rears would rub on minor bumps. I am planning on high clearance/offset arms. Where were you rubbing on the rear? The frame tube that runs down right in front of the rear tire, and right at the lowest part before it bends up and runs underneath the door. That is the common area for tires to rub in the rear. So I’ll probably not have any rubbing at all with my 28s maybe. What do you think? Did you already sell your old tires Blazer? Haven't really been able to get on the site for a few days because of database issues. I added more preload to the rear which solved the rear tire rubbing under normal riding conditions. Under a full flex/articulated condition in a ditch or rut the rear tires don't rub, but there is still shock shaft showing. I'm sure if the rear shocks were fully compressed, such as when hitting a rut a speed, they would rub. I do have custom mudflaps made from heavy big truck mudflaps that are attached between the frame tube and tire...it would prevent damage to the actual tube but the rubber is at at least 1/2" thick so less total clearance. Here is a pic when flexed out. The driver's side front tire is off the ground in this pic, but again neither the front or rear shocks are fully compressed. In this condition I can just barely turn to the right (passenger side) before the passenger side tire rubs hard against the wheelwell. Last edited by 6.2Blazer; 04-15-2019 at 10:13 AM. - Removing the balljoints from the factory arms was pretty easy with a balljoint press after finding the right size pipe and/or sockets. Had a little more of an issue getting them pressed back in to the SuperATV arms. Most of the issue was finding the right size sockets or pipe to use. For the second side I tried removing the balljoints and putting them in the freezer overnight, and then heated up the new a-arms with just a heat gun for about 15 minutes. Still took quite a bit of force with the balljoint tool to get them seated. - The only bushing that could be difficult to remove is the rear lower, which is the one piece softer rubber bushing. Used the balljoint press to remove and reinstall this one which wasn't too bad. Not sure how you would do this one without some sort of press. All the others were relatively easy to remove. - Setting the length of the lowers per the recommendations gave me too much negative camber (top of tires leaning in). Shortened the lower arms about 1/4" which put the tires right at the 1 degree negative camber suggested. - Toe was way out (toed out, or front of tires pointing outwards) which makes sense if you look at how the tierod geometry changes. Had to suggest each side tierod out about 3/8" to get the correct toe-in. Having the toe way out is really noticable as the steering feels really weird and makes it harder to turn. The front end wanted to push pretty bad with the toe out, but after adjusting feels pretty normal. 6.2, your buggy looks good! What all advantages were gained with your mods? So a quick summary of everything I have done this winter. To be clear, I'm not made of money and hobbies are always low on the list of things I will spend money on. The tree kickers and bumper only cost me the price of the tube, the tires were bought used, and I sold a bunch of stuff that was sitting around the garage to finance most of the shocks and a-arms. Haven't been on a real trail ride yet with all the mods, but expect to see big improvements in overall capability and comfort. I ride a lot of tight and technical trails (big ruts and rocks). The tree kickers and bumper will provide some body protection while the shocks, tires, and a-arms will really help with ground clearance. I had my preload loosened way up on the stock shocks trying to get a smoother ride because I was having trouble keeping up with the RZR's in between the obstacles......wasn't speed or power but the teeth jarring ride. Lost ground clearance which got me hung up on the rocks and the ride still wasn't that good. 2018 Teryx 4 Camo. 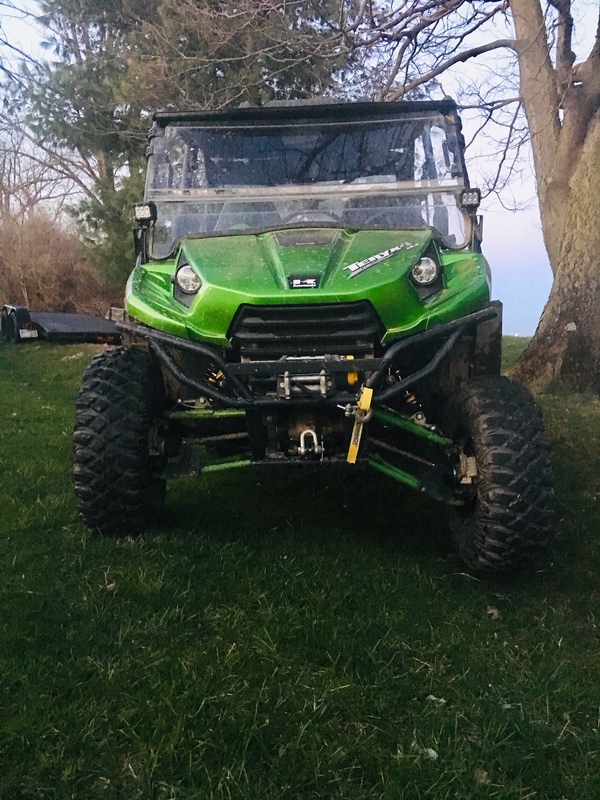 Bandits, 4500 winch, Flipper windshield, Boss stereo rocks, 2" spacers, VForce tuned! Sportsman SP850 Camo for fast times, MAGA!